Herringbone stitch intimidates a lot of people for some reason. So I was happy to see that Kalmbach decided to do a Stitch Workshop series book on it. 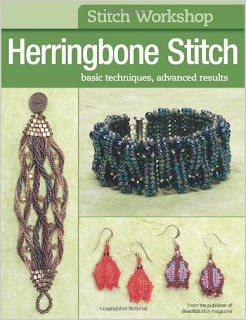 Herringbone Stitch is the third in the series, and like the others, it consists of projects that have previously been published in Bead&Button magazine. What that means for you is that the instructions are excellent and editor-tested. And it's so nice to have all the projects gathered together like this. You'll learn how to use all different types of seed beads to create flat, tubular, and twisted tubular designs. This volume will totally demystify herringbone for you, and the wide variety of designers guarantees that there will be projects to suit all tastes!